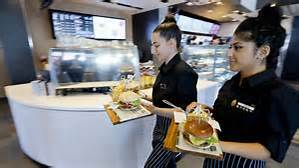 According to yesterday's UK press reports, hundreds of McDonald's restaurants will have table service by the end of the year. Table for Two please! 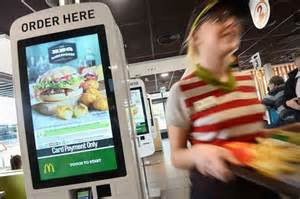 The chain has announced that it would expand the number of new restaurants which will allow customers to order and pay at digital kiosks (below) when they walk in. Then McDonald's staff will carry over the food to the customer. (There's no mention of linen napkins of knives and forks yet!). 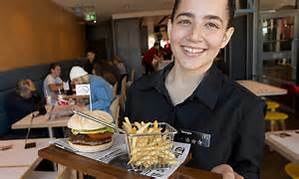 Table service has been trialled at 14 restaurants and could be in a further 350 by the end of 2016. This announcement came as the fast-food giant revealed how a cheeseburger boom has helped it to its best -ever sales last month. It reported its best fourth quarter results on Tuesday and said that sales for December were boosted by the popularity of its Spicy Chicken Winter Melts and Cheese Melt Dippers. But the classic menu choices led the way with the double cheeseburger the highest selling item for McDonald's. The company also sold more traditional black and white coffees than any of its rivals in the UK. In addition to the new table service, McDonald's has also recently introduced healthier options, such as wraps, fruit sides and salads, to its menu to cater for an increasing health conscious customer base. In 2015, the burger company trialled its Signature Collection of premium meals and it is reported that it will roll out its premium menu to 60 more restaurants by the end of February. So what size tip shall I give the waitress at McDonalds - what's 10% on a Big Mac and Fries?